In the wake of the Federal Government’s 2007 Emergency Intervention in the Northern Territory, negative portrayals have dominated media coverage of remote Indigenous communities. Reports of violence and substance abuse have been held as symptomatic of the breakdown of Indigenous family structures and the annihilation of Indigenous culture. This narrative has spilt into art criticism, where the works of senior Indigenous men and women are often viewed through the prism of a cultural mausoleum. In a discourse steeped in the melancholy longing for lost authenticity, each mark upon the canvas is framed as the last glimpse of a fading world. This is the story of group of contemporary Indigenous artists on the small island of Milingimbi, off the coast of central Arnhem Land. It is not a story of cultural annihilation, but rather, one of renewal. It shows the resilience and adaptability traditional Indigenous family systems, and how one community has internally guided transformations in familial and clan relationships in order to meet their changing needs in the modern world. In early 2006, the renowned Liyagauwumirr painter Mickey Durrng Garrawurra passed away in his home on Milingimbi. For many years, Durrng (1940-2006) and his brother Tony Dhanyala (1935-2004) were the only people authorised to paint the Liyagauwumirr’s most important clan designs: the Djirri-didi painted on the body during the Ngarra cleansing ceremony. There is a refined elegance to these designs: at their simplest they consist of nothing more than a series of austere horizontal bands of yellow, red and white. To the Liyagauwumirr, however, they contain all the mysteries of their ancestral homelands. According to Durrng, “These designs are the power of the land. The sun, the water, creation, for everything.” Rich in ‘inside’ meanings, the full ‘story’ contained within these designs was traditionally known only to initiated Liyagauwumirr men. Before his death, however, Durrng made the seemingly unorthodox decision to pass this knowledge and authority to his sister Ruth Nalmakarra (b.1954) and her family. What followed was a flowering of tradition, as Nalmakarra and her sisters used this broadened authority to instigate a cultural revival that united their community around these ancient designs. The striking visual power of the Djirri-didi first came to widespread attention in the early 1990s, when Durrng began painting them on bark. His combination of strict geometries and flat-plane fields of colour was in marked contrast to the fluidity and fine cross-hatching for which much Arnhem Land art was admired. 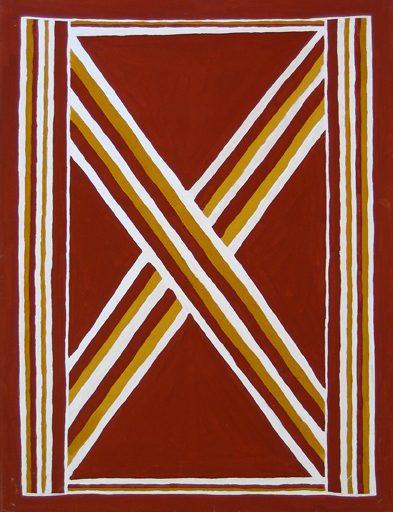 As Djon Mundine has noted, Durrng’s work was met with a mixed critical response, with many curators, collectors and critics claiming that his paintings looked “too modern.” In some cases, the crispness and formal order of Durrng’s barks was mistaken as a calculated acquiescence to the aesthetic of late-modernist abstraction. In other instances, it was simply that his cool contemporaneity was out of step with an art market that festishised the primitive. But Durrng’s primary concern was always tradition and continuity, as opposed to any aspirations towards modernism. 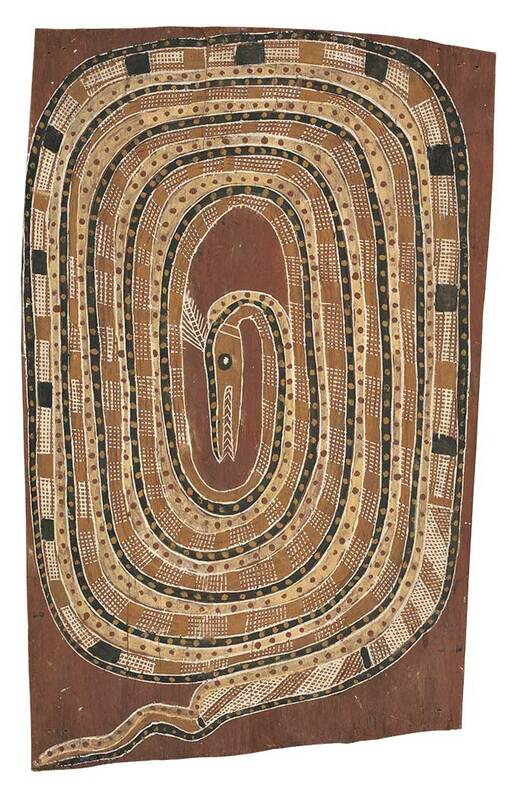 Although ‘modern’ in appearance, his designs adhered strictly to those painted on the body during the Ngarra ceremony. Ostensibly a mortuary rite performed to remember the dead and to prepare their spirits for the afterlife, the Ngarra ceremony is also a celebration of regeneration and renewal that recalls the ancestral travels of the Dja’nkawu Sisters. According to legend, during creation time, the two sisters Dhalkuwrrngawy and Barradawy crossed the landscape giving birth to the first people of the Dhuwa moiety. The sisters created the Dhuwa’s clans, languages, names, ceremonies and customs. During the Ngarra ceremony, the Liyagauwumirr paint their bodies and ceremonial objects in the tri-colour of Miku (red), Watharr (white) and Buthjalak (yellow) in recollection of the Dja’nkawu Sisters’ travels. The participants hands are painted white to signify the Sisters’ landing on the mainland at Yalangbara (near Groote Eylandt), while other markings symbolise key moments on their journey, such as sites at Garriyak and Dhambala, where they created sacred waterholes by piercing the ground with their digging sticks. Lena Walunydjunalil, Djirri-didi, ochre on canvas, 100 x 75 cm, 2006. Private Collection, Melbourne. Courtesy of Milingimbi Art Centre and Mossenson Galleries. Chris Durkin recalls vividly the first time he met Mickey Durrng. 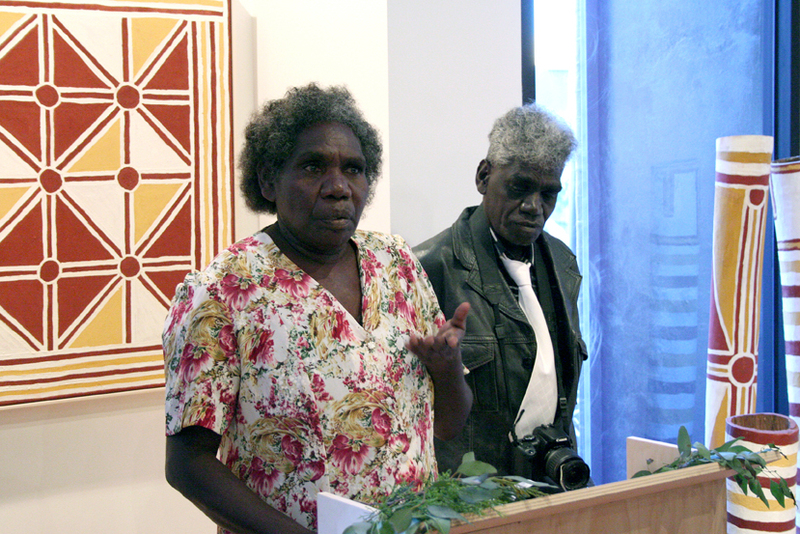 Fresh from a tenure as a field-officer for Papunya Tula Artists, in 2005 Durkin was employed by the Milingimbi Council to re-establish an art centre on the island. As an artist at the end of his life, Durrng was desperate to continue recording his stories and designs. The artist approached the newly appointed arts coordinator saying, “I’m Mickey and I’m a famous artist. I’ve had exhibitions in Paris and London. You’ve got to give me materials to paint.” Through the auspices of the new Milingimbi Art Centre, Durkin began providing the ailing artist with materials so that he could produce what would be his final body of work. As Durrng’s health deteriorated, Durkin got to know the artist’s extended family. Durrng was one of the last senior men of the great Garrawurra family of ‘seven fathers’. Durrng’s grandfather sired seven sons, of whom Durrng’s father Nupurray Garrawurra was the youngest. An artist in his own right, Nupurray fathered around 10 children of his own, including the artists Margaret Rarru (b.1940), Lena Walunydjanalil (b.1944) and Helen Ganalmirrawuy (b.1955). After the death of his elder brother Madanggala Garrawurra, Nupurray also raised his brother’s children, which included Ruth Nalmakarra. Elders have a responsibility to choose who should take over the leadership to carry on the stories. It happens this way because people are passing every day, every month, every year. In that case, before they pass, they have to call on those people that they can choose to keep the stories strong. They look to people with strong feelings and a strong voice. They appoint them to know and to carry on the story. It was unforgettable! They left it for a while after Mickey’s death, but then all of a sudden all these paintings started coming in from everywhere. And they were not ordered or repetitive, but crazy, like they had been hanging out to paint them forever. There were so many amazing designs. 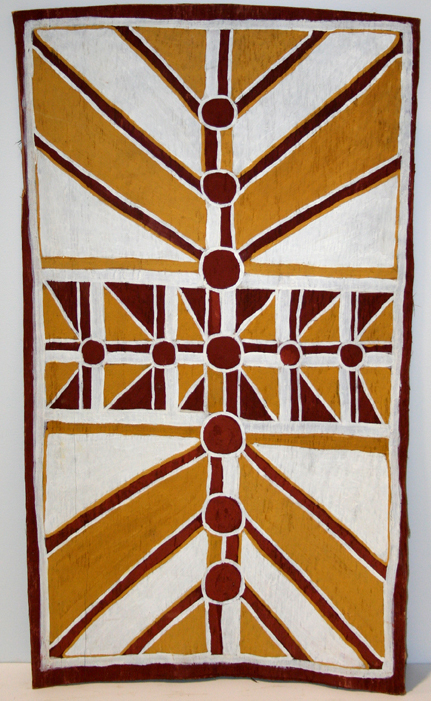 Helen Ganalmirrawuy, Gapu Milminydjarrk ( Waterholes at Garriyak), ochre on bark, 2007, 113 x 63 cm (variable). Private collection Perth. Courtesy of Milingimbi Art Centre and Mossenson Galleries. We want the children to learn that it is important for their culture, it is important for their art to be alive. That is why we have the art centre: to keep the paintings that the old people passed onto us, to keep them alive so we can pass them on to the next generation. 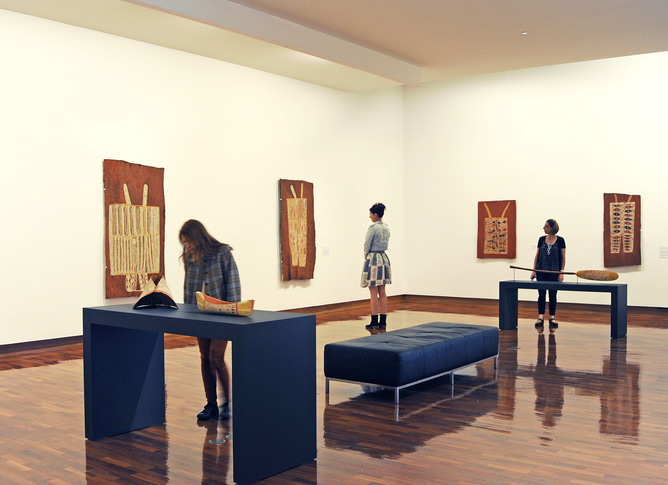 Djon Mundine, The Native Born: Objects and Representations from Ramingining, Arnhem Land, exhib. cat., Museum of Contemporary Arts, Sydney, 1996, p105. Chris Durkin, phone interview 12 June 2009. Ruth Nalmakarra, phone interview 29 May 2009. Lindy Allen, interview, Melbourne Museum, Carlton, Victoria, 11 June 2009. John von Sturmer, ‘A Limping World: Works in the Arnott’s Collection – Some Conceptual Underpinnings’, They Are Meditating: Barks from the MCA’s Arnott’s Collection, exhib. cat., Museum of Contemporary Art, Sydney, 2008, p.50. Howard Morphy, Becoming Art: Exploring Cross-Cultural Categories, University of NSW Press, Sydney 2008, p77.